Using the HMC5883L magnetometer sensor of the GY-80 module from ICStation to monitor a garage door and notify when it has been opened or closed. The Cayenne service provides much of the monitoring and notifying functionality. A major feature of this project. Cayenne takes care of all of the complicated work behind the scenes, making it easy to connect your Arduino to the cloud and allow you to monitor your garage from virtually anywhere. This project was created specifically to monitor a garage, but you will soon discover that this project could be used to monitor a whole host of other things. Monitor your front door, your back door, your bag, your chair, your cookie jar. You can find the datasheet for the HMC5883L pretty easily by searching on the internet. Here is a link to the Arduino IDE download. The IDE is required to upload code to the Seeeduino Cloud. You need the Cayenne Library installed in your Arduino IDE. There are libraries on the internet for the GY-80 module, however, it is relatively easy to use the magnetometer on this module. And therefore no libraries are required for the sensor. If you would like some more information about using the magnetometer sensor, and how to get the most out of it, then please have a look at my previous tutorial which goes into much more detail. You need to make sure to insert your OWN Cayenne token into the sketch above. You will get this token when connecting your Arduino to the Cayenne service. Watch the video for further explanation. The Master switch button is used to switch monitoring from OFF to ON (and vice versa). Therefore you can choose when to monitor the garage and when to stop monitoring. When first installing the project onto your garage door, and turning the Seeeduino Cloud on, it will automatically calibrate each sensor to a value of 1000. If you experience any drift away from 1000 for whatever reason, simply press the Request calibration button, and each sensor will be recalibrated back to 1000. The x,y and z axis widgets are there so that you can see the readings coming from the magnetometer sensor. And when any of the axis variables breach the threshold away from 1000, it will trigger the Door Status widget. This is how we can tell if the door is open or closed. We also use the Door Status widget to help with the notification system. When the Door status changes from "Closed" to "Open", a notification trigger will be activated, and a message will be sent via email or SMS. This notification is useful for monitoring when the door was opened. If you happen to recalibrate when the door is open. You will get a notification when the garage door closes. This project is relatively simple, and quite easy to set up. What I liked about this project was the versatility and alternate uses. You can use the same setup to monitor many different things. It is not just limited to monitoring a garage door. But being able to tell whether my garage door is opened or closed, especially after I have driven away from my house , is really cool. Now I don't have to drive all the way back home to check. Let me know if you have replicated this project, and also what kinds of things you decided to monitor with this project. [nebulous] has a lot of problems with his kitchen cabinets. Aside from a noted lack of micro-controllers, he was especially suspicious of the dark spaces under them. Anything could be hiding there. The core of the project is a $10 Arduino-compatible esp8266 board from digistump. The board is powered by the five volt regulator of an L298N motor driver module hooked to a power-supply. All this controls a set-of LED strips adhered to the underside of the cabinets with the traditionally bad adhesive strips with which they come standard. We can predict an hour spent bent awkwardly cursing at them, a hot-glue gun in one hand, in [nebulous]’s future. The whole set-up is housed in a SparkFun cardboard box above the microwave. You can barely tell it’s not a commercial product. We’re not certain if we like a future where even our cabinetry has an IP address. However, this is a good weekend project that could make all our cabinetry brighter, safer, and more connected. Take three NRF24L0+ radios, two Arduino Nanos, and a Raspberry Pi. Add a bored student and a dorm room at Rice University. What you get is the RRAD: Rice Ridiculously Automated Dorm. [Jordan Poles] built a modular system inspired by BRAD (the Berkeley Ridiculously Automated Dorm). The hub also allows [Jordan] to control things with his Android phone with Tasker. He has the Arduino and Raspberry Pi code on GitHub if you want to ridiculously automate something of your own. You’d probably want to adapt it to your dorm room, house, or RV, though. [Jordan] continues to work on the project and promises to have voice recognition and other features, soon. We cover a lot of home automation projects including some others described as ridiculous. The video below shows BRAD, the inspiration for RRAD. Take advantage of these open source resources to set up voice control with Raspberry Pi and bark orders at your home appliances. The post Roomba, I Command Thee: Use Raspberry Pi for Voice Control appeared first on Make: DIY Projects, How-Tos, Electronics, Crafts and Ideas for Makers. All of these control methods will take advantage of the same exact Arduino code/sketch. But how??? The MT8870 DTMF decoder is quite a neat little module that allows you incorporate DTMF technology into your arduino projects. DTMF stands for Dual-Tone Multi-Frequency. DTMF tones are commonly associated with touch-tone phones and other telecommunication systems. 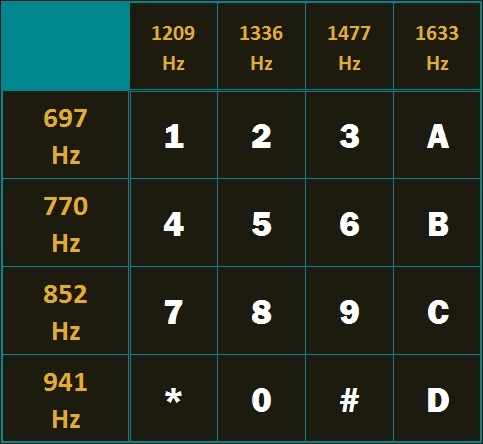 When you press the number "1" on a touch-tone phone, two sine waves with frequencies: 697Hz and 1209Hz are combined to produce a unique DTMF signal which can be transmitted through the phone line. The MT8870 DTMF module can take this signal as an input, and decode it to produce a binary output. The DTMF module does not care how you produce the DTMF tone. However, if it receives this tone, it will decode it. We can take advantage of this feature to supply the module with tones from different sources. The module has a 3.5mm port for line input. Providing you can connect your DTMF source to this line input in some way, it should work. I must warn you, however that this is a line input and NOT a microphone input. If you wanted to use a microphone, you will need to boost or amplify the signal before sending it to the DTMF module. Upload the following sketch to the Arduino. 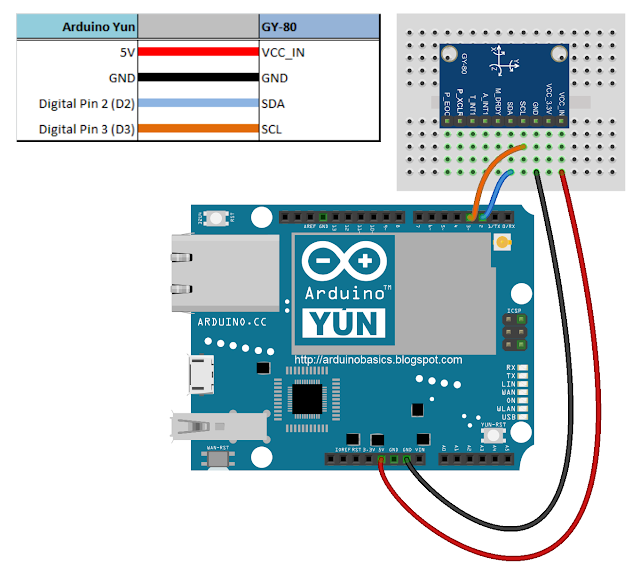 Connect the Arduino to the MT8870 DTMF module, and to a Servo. 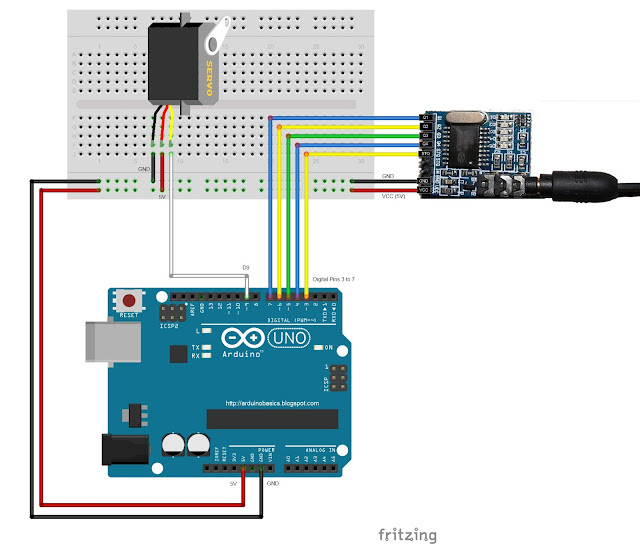 Use the following Fritzing sketch as a guide. You will need to connect a cable from the DTMF module's 3.5mm port to that of your smart phone, computer, voice recorder or any other DTMF source of your choice. When you power up your Arduino, the Servo motor should turn all the way to the left to it's zero position. Once the DTMF module receives a DTMF signal, it will identify the relevant frequecies as described in the table at the beginning of this tutorial, and produce a binary like output. You will notice the DTMF module's onboard LEDs light up when a tone is detected. Onboard LED (D5) will turn on for the length of the DTMF tone it just received, and turn off when the tone has stopped. On the other hand, the onboard LEDs (D1 to D4) will light up depending on the tone received, and will remain lit until the module receives another tone. The onboard LEDs are a visual representation of the voltages applied to the DTMF module's pins (Q1 to Q4, and STQ). Q1 matches D1, Q2 matches D2 etc etc. and STQ matches D5. You will notice that there are two STQ pins on the DTMF module. The STQ pin that is closest to Q4 will only go high when a DTMF tone is detected, and will remain high for the duration of the tone. The other STQ pin is the exact opposite. It will switch LOW when a tone is received and remain LOW for the duration of the tone. When there is no tone, this STQ pin will remain HIGH. The table below provides a summary of the DTMF module outputs, with a blue box representing a voltage applied to that pin (HIGH), whereas a black box indicates no voltage applied (LOW). As you can see from the video, I also recorded the DTMF tune onto a voice recorder, and was able to control the servo that way. 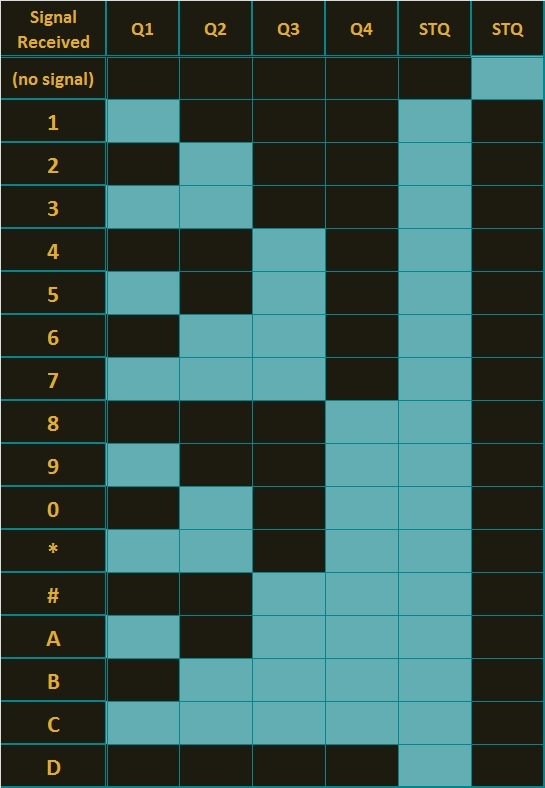 If you are not feeling creative, you can visit this website to create DTMF tones from your browser. This project was very fun, and shows some novel ways to control your Arduino. After completing the project, I realised that I could use this module to alert me when new emails or messages arrive on my phone or computer. 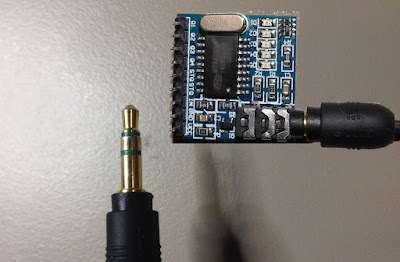 If you have the ability to change the email or message notification sound to a DTMF tone, you should be able to get the module and Arduino to respond accordingly. Oh well, maybe I'll save that project for another day. If this project helped you in anyway or if you use my code within your project, please let me know in the comments below. I would be interested to see what you did. Feel free to share this page with your friends in any way you see fit. The last few years have seen an incredible increase in the marketing for home automation devices. Why this tech is just picking up now is something we’ll never understand – home automation systems have been around for decades, mostly in the form of security systems. For his Hackaday Prize entry, [IngGaro] is building an Arduino-based security system that does everything you would expect from a home automation system, from closing the shutters to temperature monitoring. [IngGaro]’s system is built around a shield for an Arduino Mega. This shield includes connections to an alarm system, a GSM modem, temperature and humidity sensors, an Ethernet module, and IR movement sensors. This Arduino Mega attaches to a control box mounted near the front door that’s loaded up with an LCD, an NFC and RFID reader, and a few buttons to arm and disarm the system. This project has come a long way since it was featured in last year’s Hackaday Prize. Since then [IngGaro] finally completed the project thanks to a change in the Ethernet library. It’s much more stable now, and has the ability to completely control everything in a house that should be automated. Now all [IngGaro] needs to do is create a cool PCB for the project, but in our opinion you can’t do much better than the mastery of perfboard this project already has. Use an Apple Watch to automagically open doors at home or at work with a tap on your wrist. The post Make an Apple Watch Door Unlocker appeared first on Make: DIY Projects, How-Tos, Electronics, Crafts and Ideas for Makers.